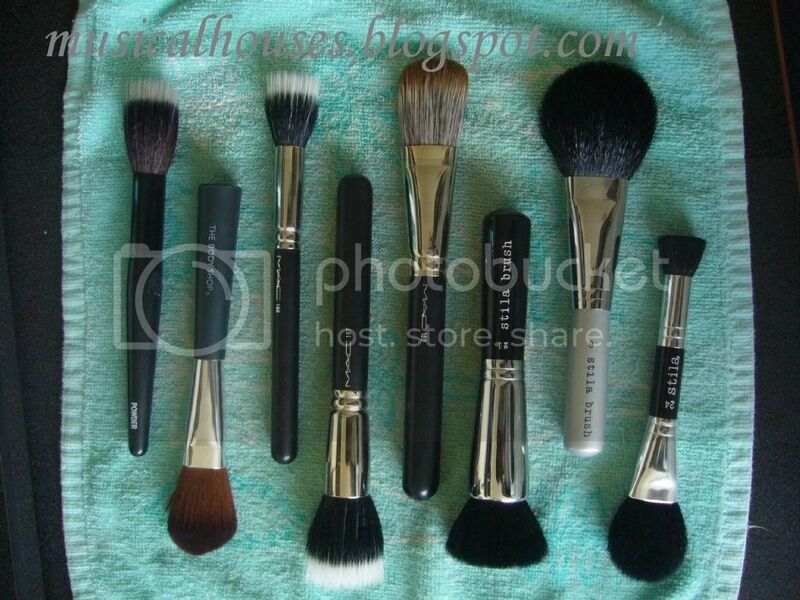 Anyway on the topic of face brushes. Today we're reviewing the Flirt! Feather Dust-Her, the Stila #8, and the Stila #21, all of which are brushes which make my heart melt with delight everytime I see them. First of all. The Flirt! brush is really nice, and it has bristles that are floppier and sparser than the 188. Unfortunately, this sparseness and floppiness means that it picks up...almost nothing. At least, that is if you're using it for powder. However, when used it for cream blushes, it gives the perfect application! I like how the soft bristles work well with all types of cream blushes, from the harder Bobbi Brown ones to the soft-as-mush Becca ones, but this one works with all of them. I think in this case the floppiness of the bristles works to its advantage - you don't get dots of cream blush on your face as might happen if the bristles of a skunk brush are too unwieldy, you just get a nice blended look. This is my HG brush for all cream blushes, although it's totally useless for powder. Lastly, we have the Stila #21. Unlike it's sister, it's actually still in production - so if you use pressed powder or blush, get this now! I love how I can use this for any and everything - except eyeshadow, LOL. For pressed powder or loose powder, I use the entire circular face of this brush, and for less pigmented blushes, I also 'stamp' on the brush using its circular face. For more pigmented blush, however, as well as for highlighters, I use the edge of the brush, and gently blend it in. Viola! Face done! I could use this for powder, then blush, then highlighter, and throw on some lippie and be out of the door, so this is really a great multi-tasker. It's really one of the best brushes there is! I've tried the Stila #21, but I found the bristles to be not soft enough. They weren't scratchy, but they weren't as soft as my other brushes. I'm very picky about my brushes. They must be very soft.